North Carolina State University received more accolades for providing a quality education at an affordable price today as the university ranked fourth in the “Top 10 Best Value Public Colleges for 2014,” released by The Princeton Review. 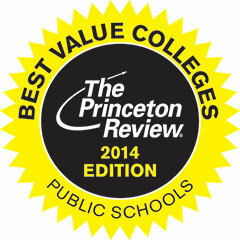 An education services company, The Princeton Review chose its “Best Value Colleges” for 2014 based on criteria covering academics, cost of attendance and financial aid. The methodology examined more than 30 factors using data from the company’s surveys of administrators and students at 650 colleges with strong academic programs. NC State is no stranger to Princeton Review best-value rankings. In 2013 and 2009 it was sixth on the best-value list, while in 2006 it was named both second best value and one of the nation’s 25 “most connected” campuses. NC State also appeared on the 2013-14 best-value list compiled by Kiplinger’s (16th in-state best value), and was fifth in best overall public university value according to U.S. News & World Report’s 2013 rankings, which were published in fall 2012.